Coming to Ben Tre, you will be amazed by the simplicity, yet beauty of the region. For miles the coconut trees cover the land, the gardens with fruits ripe on the trees, the people are friendly, simple, and adorable. And last but not least, the foods are just incredibly amazing. The first thing to talk about Ben Tre is to talk about coconut. The coconuts are everywhere, in the daily lives of the people, in the food, in the mind and the soul of the locals and in the memory of the visitors. There are many types of coconuts: the Vietnamese coconut, berry coconut, fire coconut, grass coconut, wax coconut, but the most grown and probably the most well-known is the green coconut. The juice is elegantly sweet, a bit sour, but not too much, and because of that, the locals dub it it the “sugar coconut.” The fresh coconut juice is a superb beverage, which will help you cool down in a summer day. It also helps treat constipation and fever. It also helps pregnant women to increase the amniotic fluid in wombs, which are good for babies. Accompanying with the green of the coconut is the sweetness of the coconut candy which has become the icon of this delightful wonderland. To create a chewy, yet sweet and irresistible coconut candy, it is required a little bit of secret. Choosing the right coconut and adding the special ingredients, the people of Ben Tre consider making candy as an art and tradition more than as a business (although it is a very flourishing one). 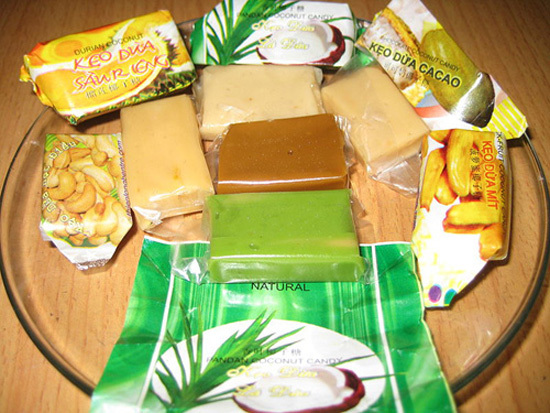 Nowadays, there are so many types of coconut candies with so many different flavors: cacao coconut candy, durian coconut candy, peanut coconut candy. 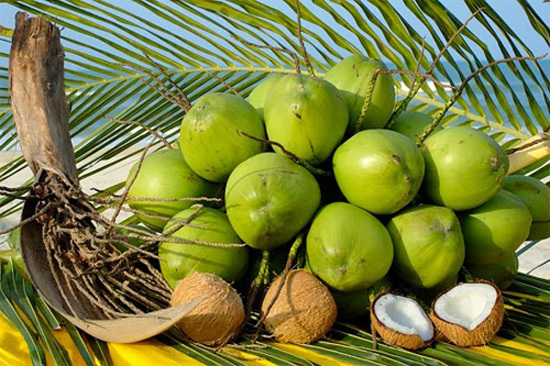 Each has a distinguish flavor but retain the most important factor: the flavor of the coconut. The “Củ hủ dừa” is the name of the core of the coconut. It can be found at the top of the tree, hidden inside the roots of the branches. The core is white and sweet, covered by a thin layer of capsule, and is big quite big. There are many ways to cook the core, and there are also many delicious dishes which have the core as main ingredients. Some dishes such as fried Củ hủ dừa with chicken organs, fried Củ hủ dừa with Vietnamese pancakes, fried Củ hủ dừa with shrimp, Củ hủ dừa salad, stew Củ hủ dừa with pork, Củ hủ dừa with meatball soup, or just simple eat it raw. The coconut core is sweet, fresh, cool and highly nutritious, especially minerals, and it is good for digestive system. 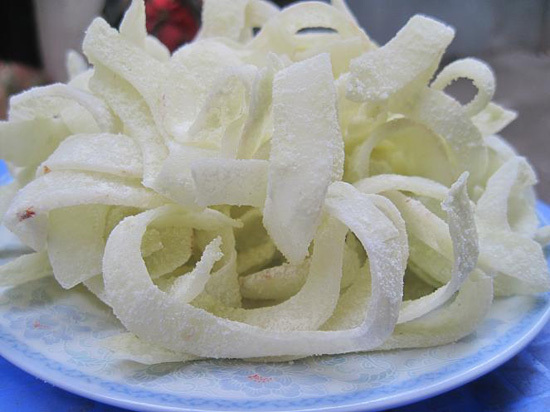 Don’t forget to try the Củ hủ dừa when you have the chance to visit Ben Tre. Coconut worm is a type of lava feeds on the roots of the coconut trees. The lava is as big as little finger, white, and very fat. Not many people have the gut to try the raw lava. Very easy to cook and delicious to eat, the lava is best served live inside a bowl of chili fish sauce. Before dropping the lavas into the fish sauce, the chef will drop them into a cup of rice wine first so to remove any dirt and contaminants. After washing the lavas, the chef now can put them into the fish sauce and serve. The lava is extremely fat, and the taste is very similar to the melting yolk in your mouth. 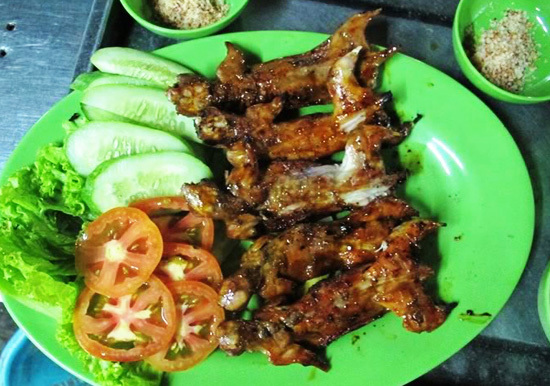 To many who don’t want to eat the lava alive but still want to try one of Ben Tre’s finest cuisine, there are many other choices for you. There is the fried lava with butter, which is rich, fat and delicious. There is also the grilled lava with salad, lettuce, and basil. When eating the grilled lava, you can use the salad leaves to wrap around the lava and dip the combination into the tamarind sauce. The sour of tamarind, the fresh and bitter of the herbs and the fat of the lava will make you want more. There is also the lava with steamed sticky rice, which is soft, chewy and fat. Coconut wine is a special cuisine of Ben Tre. Unlike other wines, the coconut wine will not make you drunk but just a special taste. The wine is more like a strong, sweet and elegant cocktail. Coconut wine is now a very famous product. 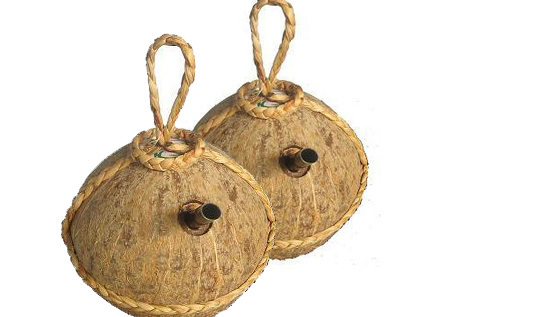 The wine “bottle” made of the coconut shell, hanged in a basket is a perfect gift for anybody. Not only the wine is a part of Ben Tre, the wine also extends the long list of alcohol beverages of Vietnam. Coconut rice is a unique dish which is nowhere to be found but Ben Tre. The rice is cooked using the coconut juice, which makes eating each grain is like eating the coconut itself. The rice used to cook has to be soft, aromatic. After washing and letting the rice to dry, the cook will use a sharp knife to cut the top of the coconut to let the water out and use the coconut as the cooking pot. The hardest part is to measure the right amount of coconut juice, if there is too much water, the rice is wet, too little and the rice is dried. The best time to eat the rice is when it hot. If it is put too long in the air, the rice, because of the oil from the coconut, will turn yellow. One essential dish to eat with the coconut rice is the fried shrimp. 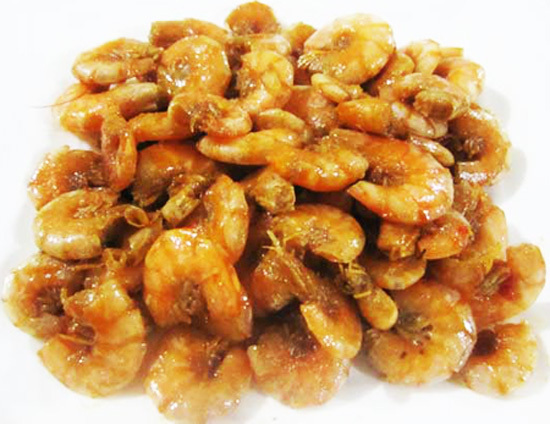 Any kind of shrimp: dirt shrimp, round shrimp, green legs shrimp is good to eat with the rice. After removing the legs and washing the shrimps, the cook now will marinate them with sugar, salt. 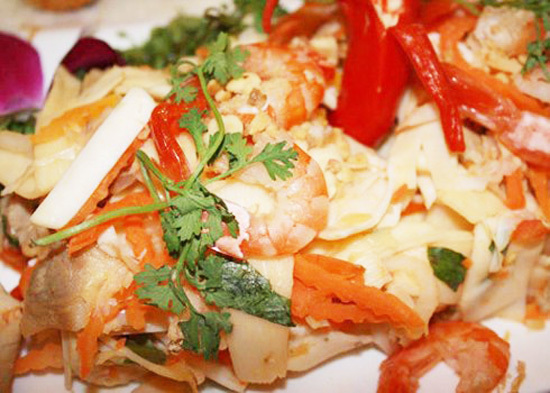 The shrimps have to fry with the coconut milk to increase the boldness. After putting the shrimps in the frying pan, the cook will pour the coconut milk into it, and turn the fire down. When the shrimps have absorbed the milk and turned into the brick-red color, it is ready to serve. The shrimps, thanks to the coconut milk, are chewy and flavorful, combined with hot and sweet coconut rice is a delightful experience that you should defiantly try sometime. 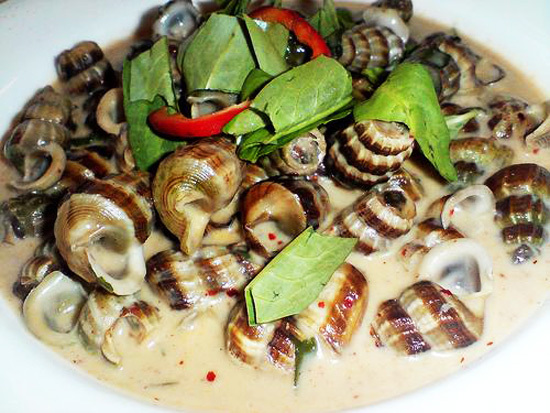 There are many types of snails which you can use to cook the delicious roasted snail with coconut milk. The fat and rich of the coconut milk blend with the elegant sweet of the snails are exceptionally enchanting. In all of the phases of making the dish, marinating is the most important one. While the snails and the coconut milk are indispensible, the lemongrass, garlic, chili, sugar, salt, and fish sauce are the key to success. Eating the snails and sipping the coconut milk, you will encounter the richness, the spicy, and the fatness from all of the ingredients. The coconut mice have the sizes like the paddy field mice, but this type of mice has sharper teeth and they are harmful to the coconut trees. Using the sharp teeth, they open the coconut and eat the meat inside. Their meat is fatter than chicken and better than the regular paddy field rice mice thanks to the coconut. There are many ways to cook the mice. You can grill, steam, roast, curry. However, the best is the steamed coconut mice. After washing the mice and removing everything but the meat, the cook will put the meat on banana leaves, and put everything into the rice cooking pot. The meat is white and has a special smell. When eating, you can also use a bowl of salt-n-pepper lemon sauce to dip the meat and some cilantro. 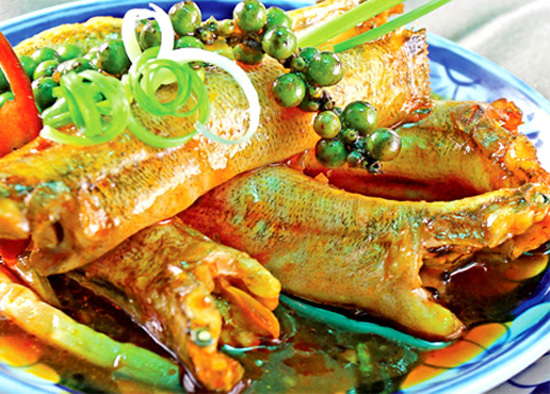 Visiting Ben Tre, you should write down in your check-list to try this peculiar yet amazing dish. Roasted shrimps with coconut have a very beautiful red. The best type of shrimp to make the dish is any type of shrimp available. The coconut milk will do the heavy-lifting. After washing the shrimps, the cook will marinate them using salt and sugar for half an hour. The coconut to cook is dried and small. Scrubbing the meat off the shell of the coconut, adding in bit water, the cook has to squeeze the milk off the mixture to create the coconut milk. Pouring the coconut into the shrimps, the cook will start to roast the combination until all the milk has gone. The dish can also use a bit of cooking oil to make the shrimps shinning. The shrimps usually come in the big water from August to January of the lunar year. The best time to catch the shrimp is right before Tet. If you like the shrimp to be soft choose silver shrimp, or if you like it to be crunchy, choose any kind of shrimp. The roasted shrimp with coconut, eaten with porridge is the best. The daily meal of a local family will consist of the roasted shrimps, rice, and the stew pumpkin soup. Ben Tre is a region which has plenty of rivers; therefore, a lot of gobies nested themselves under the roots of the riverside coconuts. The gobies are soft, but a bit chewy, sweet, less fat and bone, and have distinguishing smell. After washing and cleaning the fish, removing the fins, the cook can now stew them on the pot of coconut milk on top of a small fire. When there is no milk left, the fish is ready. 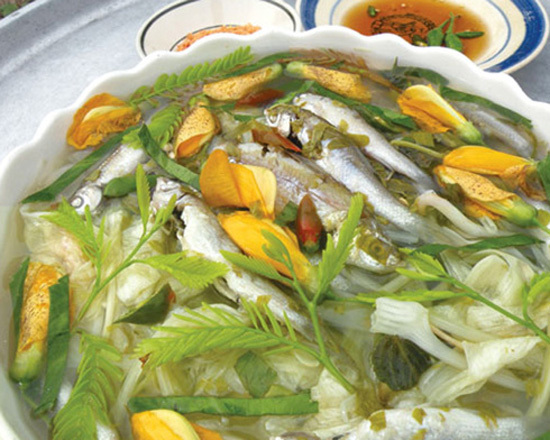 The fish’s bones, after cooked, are easily removed. Coconut jam is a traditional cuisine in Tet, anniversary of the Southern people, and also the people in Ben Tre as well. 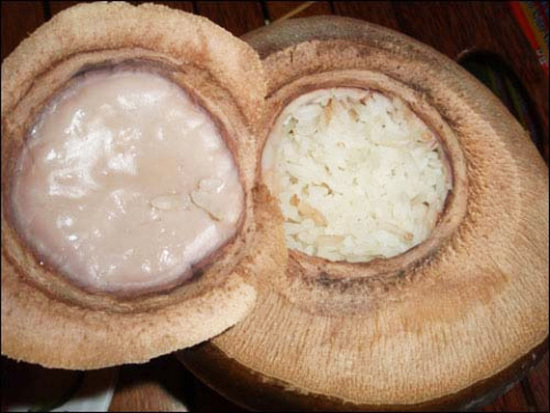 To make the jam, the coconut has to be ripped and taken only of the meat inside. Scrubbing the meat, removing the shell which might still stick on it, the cook will also need to chop the meat into long, thin pieces, rewash the coconut meat, mix the meat with sugar, put the mixture on small fire, and fry until the coconut meat is all dried up. The coconut jam has to be dried, and also sweet. The jam can also use some colors from pineapple leaves or beetroot. Not only using coconut to make jam, rice, stick rice but the people in Ben Tre also like to use it in their pots of porridge. There are many ways to cook this dish, like after washing and cooking the rice until the rice is all broken, then the cook can pour in the milk. However, the pouring only should take place after the first water of the porridge (unlike rice, the porridge needs more water). 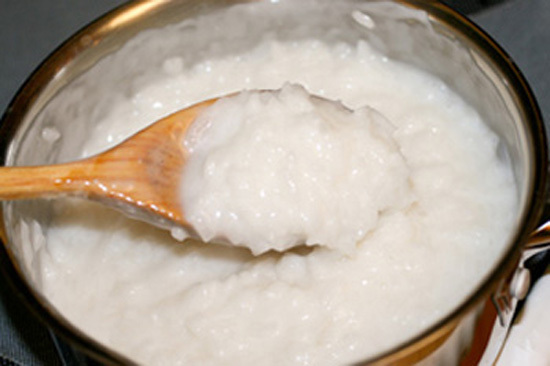 The coconut porridge can eat with sugar, or with snakehead to increase the nutrition. The rich of the rice, the sweet of the fish and the fat of the coconut is a wonderful combination. The porridge should be used cold to be able to fully appreciate the fat of the coconut. The dish is simple, after a few water times, and a cup of coconut milk, and then the porridge is ready to be served. Depends on yours references that you add salt or sugar should be added in. Besides from snakehead, the porridges can use gobies, catfish, and mussels as replacement. 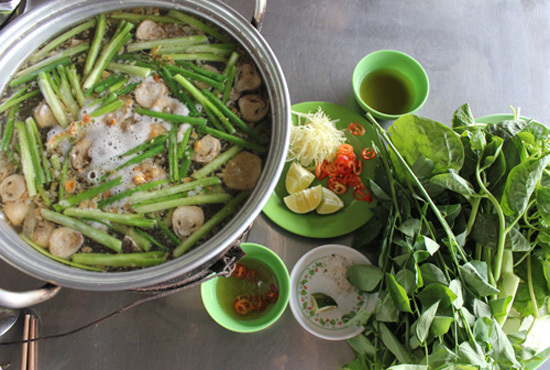 The porridge also requires some herbs to eat with such as minced cilantro, banana branches, and a bowl of fish sauce. In the Mekong Delta, the My Long rice paper is very well known. 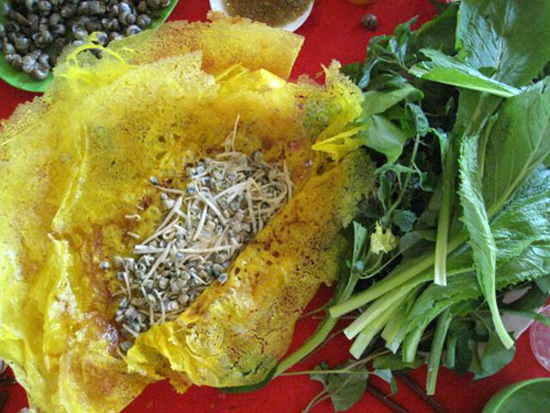 All will know about the rice paper because of its softness, fatness and the wonderful smell when grilling the paper on fire. 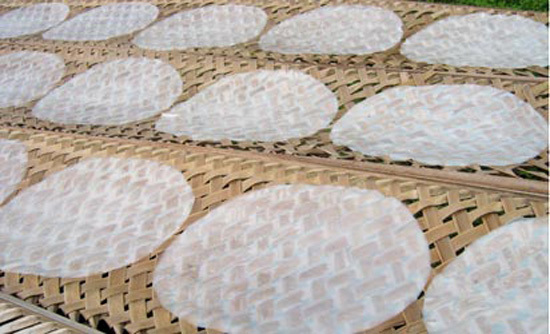 There are three types of rice paper: rice paper with milk, or with eggs, or with coconut. And there is not combination of the two. When grilling the paper, you need to make sure both sides are equally grilled. The paper is best to be served hot, and the diverse flavors will make like no other snack in the world. Floppy cracker is the pride of the people in Son Doc District, Ben Tre. The smell of the sticky rice and the coconut embedded in every cracker that will make you linger for more. Son Doc floppy cracker is famous for the strict rice selecting process. In order to have a perfect cracker, the rice has to be purely sticky rice, not the regular rice. The grain also has to be removed of all the shells; otherwise the cracker will not be very smooth. How to cook the coconut is also important. To wet and the cracker will be less fat, too dry and the cracker will have the smell of coconut oil. The cracker is smaller but thicker than the regular cracker. The best type of fire is from the straw or from coal. The Southerners usually chop a part of the coconut branches to use as a fan, and they also have to be quickly turning the cracker so it can be well-baked and crunchy. 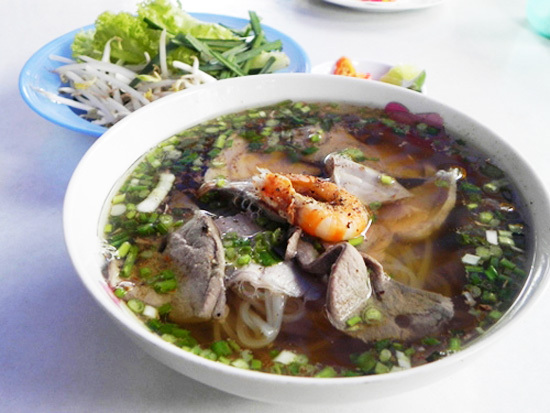 My Long noodle is a bucolic, yet elegant of the people in My Long District, Ben Tre. The noodle includes pig’s stomach, liver, boiled thick, yet sweet slices of pork. The dish also has some delicious boiled squids with the size of three fingers, a yellow crunchy fried shrimp roll, and the soft, long and sweet noodle. You should also need some chives, sprouts, chili into your bowl, a slice of lemon and a bit of soybean sauce to increase the flavor. Oh, and also remember to mix everything before you eat. The stomach is crunchy, the liver is soft, the meat is sweet, the roll is salty, and the broth is sweet and spicy thanks to the chili and others ingredients. A combination likes no other. Coming to Ben Tre, people tend to think about the coconut tree more than anything else. Well, Ben Tre also has more to offer. 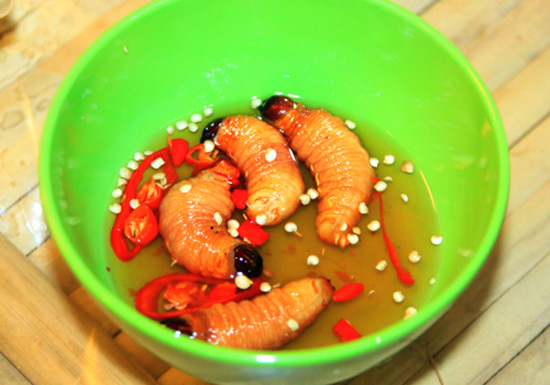 One special cuisine is the termites mushroom. The mushroom grows on a termite soil extrusion, and usually edible since April of the lunar year until the mushrooms die on about July. The best time to collect the mushroom is May. 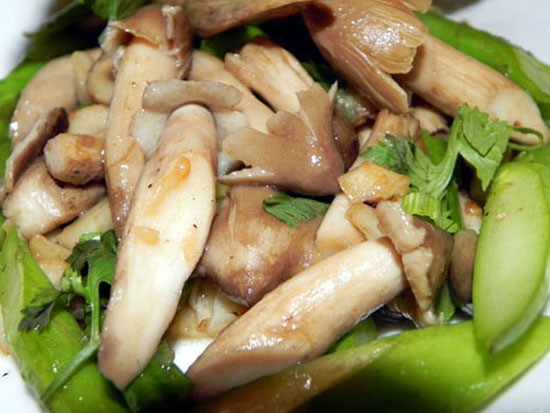 The mushroom is rich, sweet, and a bit chewy, which is a feature of this mushroom. The mushroom is highly nutritious, and could help fight aging. The mushroom is easy to make: make soup with pork leg, roll to make salad, fry with coconut core, hot pot, core of the traditional pancake… One simple formula which is favored by the locals is to grill with chili salt. The sweet of the mushroom combines with the hot of the chili is just strange, yet worth trying. 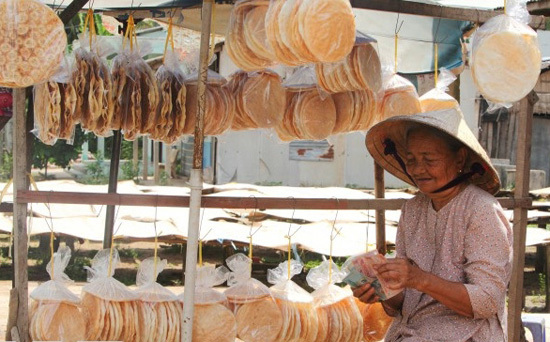 The pancake is a very simple dish, yet many from far away have to come and try out this wonderful cuisine of Vietnam. The best place to have a delicious dish of pancake is Lach Market. In the entire Me Kong delta, there is only Phu Da Island has the rice snail, only from April to July, lunar year time. The smell from the cake, combined with the coconut milk, sliced cassava, sprouts, and the snails will make you order a second. 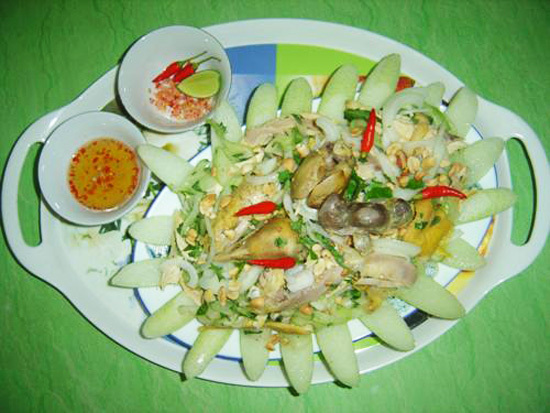 Mentioning the chicken salad, many will think about the common chicken with banana branches, with lemon leaves, with lotus, with cucumber… but fail to imagine how delicious the chicken salad with sweet taro is. The sweet taro looks like peppermint tree, which is short and solid. The top of the tree there will be some brown dots. The taro is sweet, and it suitable to go with any dish: fried with pork, with pancake, make sour soup, salad. The best one is with chicken. When eating, you should feel free to use the rice paper as a wrapping device for you dish. Putting the chicken, the herbs, and rolling in, dipping the roll in the fish sauce, and slowly chewing, you will instantly recognize the sweet of the chicken, the sour and sweet of the taro. When choosing the dangila, the cook will consider the bigger one to have more meat. Cutting the under-fins away, and squeezing the guts out, the cook will marinate the fishes with salt and sugar. The first dangila of the season is usually the fattest. Also, the chopstick flowers are crucial. The best time to collect the flowers is in the early period of the season, when they are sweet and crunchy. The dangila sour soup is cooked on only one fire, which means there is no leftover and reheat. If you reheat it, the fish will usually be crushed. The herbs are also important. Some coriander, cilantro will do the work. Also, you will want to eat the soup with some chili, sugar, salt or fish sauce. When the soup is boiled, you can drop the fish in and cover the pot. Watching the soup, when it is boiled again, you drop in some chopstick flowers. The soup has to be neutral, not too sweet or to sour. And don’t forget to drop in a few slices of chili. After washing the crab, removing the shells, you will have to grind the meat, and add in some other ingredients. With the shell, you also grind it, pour in the water, and take the water only to make the broth. The hot pot also needs some mushroom, beans, and green onions. After trying the initial broth, you can pour in the shell water. Lastly, you drop the meat in. Tasting the hot pot, you cannot forget the key feature of the South land, the herbs. There are five herbs: katuk or sweet leaf, Malabar spinach, centella, Egyptian cucumber or Vietnamese luffa and Corchorus. A few more slices of chili, fish sauce will be perfect.